Get rid of those old drums and shoes! Install this kit and dramatically improve your braking performance. Easy installation instructions! This is a heavy duty brake system. The rotors are 12mm thick. May be the last brakes you have to buy! 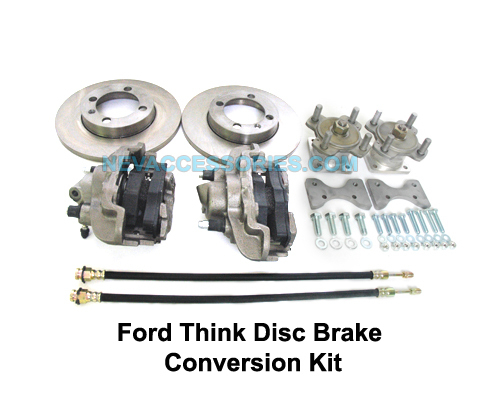 Comes with all the hardware needed to change out your Ford Think drum brakes for disc brakes. 12 inch stock wheels require our wheel spacers. This will fit all 2002 Ford Think Neighborhood Electric Vehicles. I am not even a weekend mechanic, but I installed these in about 5 hours. Probably 3 hours for the first wheel, 1 hour for the second, and 1 hour to bleed the brakes. The quality is outstanding and the car will now stop on steep hills. Instructions could have been better, but would suffice for a more experienced mechanic. Used with Honda 14 inch steel rims and 175/65 r14 and no spacers needed.